Images are from a couple of weeks ago. The last few days there haven't been many photo opportunities as we are in the midst of the nor'easter that is visiting us as it leaves the New England coast. More rain and high winds are expected to continue today, and there storm surge warnings for our coasts as we experience high tides. Flooding will occur again today more than likely. 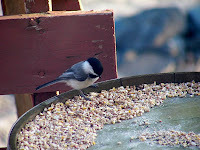 This little Chickadee ponders which tasty morsel of grain he will choose next. 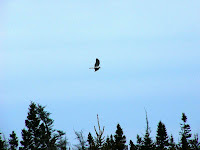 A male Marsh Hawk soars above as he searches for 'lunch' .............. and a plumb Robin sits in a maple tree and sings. 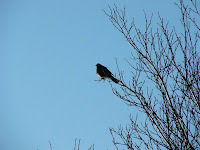 Things have finally settled down here and some warm weather is coming in. Maybe. I saw a flock of goldfinches last night as I was leaving work! 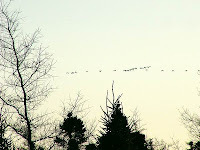 Looks like the Geese are riding the tail winds of the nor' easter!